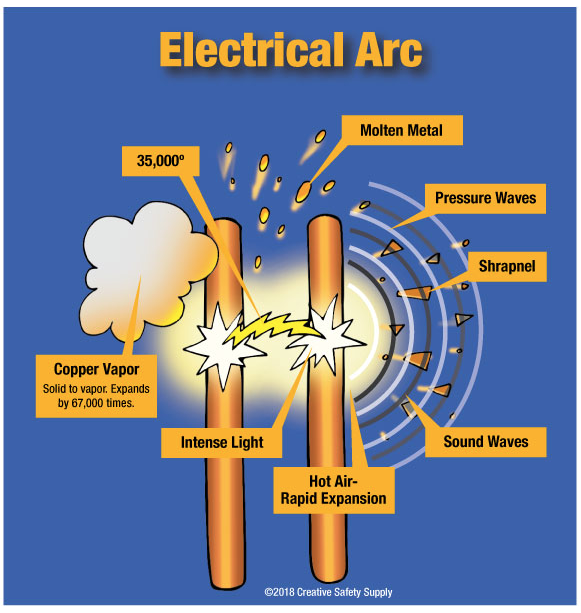 Electric Arc Info Page : How they relate to arc flash and electrical applications. Electrical safety is paramount to maintaining any efficient and productive facility, and one of the greatest threat to worker safety is electrical arc and arc flash. For safety managers, making sure the facility is free of electrical arc and arc flash hazards, and has taken action to minimize damage in the case of one of these accidents. Electrical fires cause catastrophic damage, and in industrial settings, these are often caused by electrical arcs of one kind or another. 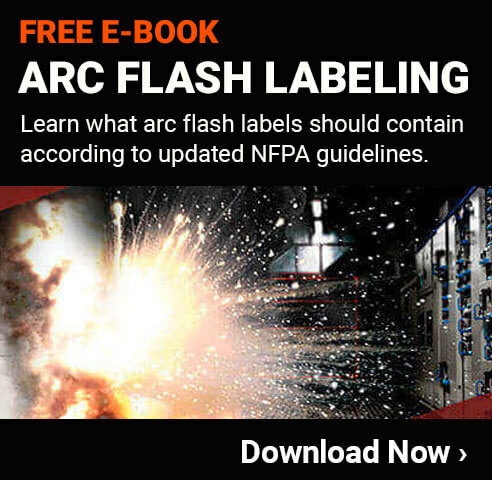 While some types of electrical arcs are hard to miss"an arc flash is loud and involves a big, bright explosion"some electrical arcs like an arc fault are subtler, but can be just as destructive. Arc faults are often responsible for electrical fires in residential and commercial buildings. Put simply, an electrical arc is an electrical current that is intentionally or unintentionally discharging itself across a gap between two electrodes via a gas, vapor, or air and expending a relatively low voltage across the conductors. The heat and light produced by this arc is usually intense, and can be used for specific applications, such as arc welding or spotlight illumination. Unintentional arcs can have devastating consequences, such as: fires, shock hazards, and property damage. In 1801, British Chemist and inventor, Sir Humphry Davy, demonstrated an electrical arc to his fellows in the London Royal Society, and offered the name, the electrical arc. These electrical arcs, when uncontained, look like jagged strikes of lightning. This demonstration was followed by the further studies of the electrical arc, as illustrated by Russian scientist, Vasily V. Petrov in 1802. Further advances in early electrical arc studies produced such industry-important inventions as arc welders. Compared to a spark, which is only momentary, an arc discharge is a continuous electrical current that develops so much heat from the charge carrying ions or electrons that it can vaporize or melt anything within the range of the arc. An arc can be sustained in either DC or AC electrical circuits, and it needs to include some resistance so that increased current does not go unchecked and completely destroy the actual source of the circuit with its heat and energy draw. When harnessed correctly, Electrical arcs can have useful purposes. In fact, there are a number of daily tasks all of us do that is thanks to the restricted application of electrical arcs. Electrical arcs are used in some camera flashes, spotlights for stage lighting, fluorescent lighting, arc welding, arc furnaces (for making steel and substances like calcium carbide), and in plasma cutters (in which compressed air is combined with a powerful arc and converted into a plasma that has the capability of instantaneously cutting through steel). Electrical arcs can also be extremely dangerous when not intended. Situations where an electrical arc is created in an uncontrolled environment, as in the case of an arc flash, can cause personal injury, death, fire, equipment damage, and property loss. Arc flash-rated gloves - These gloves are designed to protect hands from electrical shocks and minimize injury in the case of an electrical event. Arc Flash Video Training - These training sessions will keep your staff up to date on the dangers of working in energized environments and how they can protect themselves. Arc Flash Hazard Calculator Software - This intuitive Arc Flash calculator and analysis software to make it easier to evaluate your facility's electrical systems.